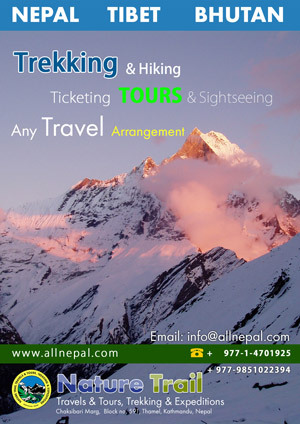 Wildlife Safari in Nepal | Provides complete information about Nepal‘s local product, business, news, events, coupons, local hero, local model, local culture, travel, trekking, biking or anything that related to Nepal. Nepal seems as the paradise for the nature lovers. For those who wish to experience the natural environment at its best there is no other better places than Nepal to visit. There are all together three National Parks in Nepal and they are all rich in flora and fauna. There are also many extinct animals and plants preserved in these parks. The most popular among them is the Chitwan Natioanl Park which is often visited and near from the capital city as well. The outdoor adventure sports into the wilderness to see wild animals, birds and natural beauty. You ride on an elephant’s back or on a four wheeler jeep accompanied by a fully trained guide (Naturalists) to view the nature and animals. From a tourist point of view, Chitwan and Bardia are the most popular National Parks for wildlife safari in Nepal. Chitwan is Nepal’s most popular National Park offering excellent opportunity to see Royal Bengal Tigers, one horned Rhino, crocodile and thrilling wilderness experience into its deep and thick jungle. Bardia is Nepal’s second most popular National parks offering excellent jungle safari. Ride on an elephant’s back or on four wheelers will lead you to path where you can discover some rare natural habitats. Most jungle safari consists of canoe rides on the jungle’s rivers, nature walks, birds watching excursions and quick Tours around the villages to discover unique culture and traditions of the local village people. Magnificent site. Plenty of helpful info here. Iˇ¦m sending it to a few friends ans also sharing in delicious. And naturally, thank you for your effort! Thanks a ton for posting this, I found it quite informative, and it answered most in the concerns I had.